Suanthai Restaurant was awarded Singapore's Top Restaurant in 2008 and 2009. I hadn't heard of this place before - so when my friend Pooh Bear Girl discovered that Suanthai offered an a la carte buffet (as described here), we decided to give it a go. We visited Suanthai for dinner on a Friday night - although the tables on the inside were unoccupied, we ended up having to sit outside al fresco style since all the tables had been reserved. Definitely not a plus when temperatures are sweltering and you are seated right next to the busy, smoky road. We (Pooh Bear Girl, Choir Boy and I) paid $19.90 per pax and added $1.99 for free flow of Ice Lemon Tea. For the price, you get a full selection of the 28 items on the standard menu (although some items may only be ordered once). Green Mango Salad - I found this offering to be somewhat mediocre. Texture wise this was a very crunchy salad, with tangs of sweetness hidden underneath the otherwise bland, cucumber-like greens (not a fan of cucumber here). This dish was a favourite of Pooh Bear Girl's however. Deep Fried Egg Beancurd with Special Sauce - If you like the traditional Egg Tofu you get with combination mixed rice, you should love this dish! Think of it like Super Egg Tofu! 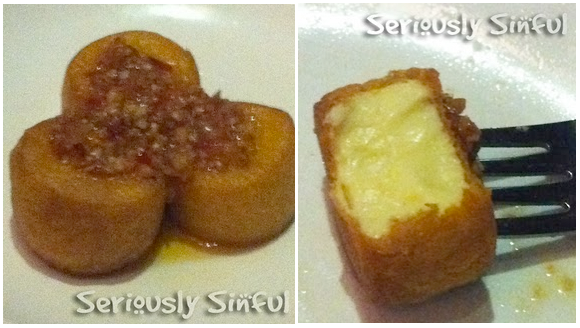 The beancurd is deep fried to perfection, with a crunchy exterior and tofu that melts in your mouth. Yes, I made it sound like an M&M commercial. The sweet thai chilli with herbs complemented the beancurd to perfection, adding an extra kick to the taste. Thai Papaya Salad - Really good salad :) Pictured on the top right of the introductory picture, this salad was crunchy and satisfying. The blending of fish sauce, sweet chilli and cashew nuts went very well with the papaya. It ended up acting as a palate cleanser between dishes because of its refreshing nature! I found the long beans to be slightly out of place but then again, that was easily solved. Thai Spring Roll & Thai Fish Cake - Did Not Like; give these so called 'staples' a miss, in my opinion. The Thai Fishcake was overcooked and rubbery - I gave up on eating it after two bites. Tom Yum Soup - One of the nicest Tom Yum Soups I've had in a while! This soup was authentic, if rather simple. We ordered the chicken Tom Yum soup - my only regret is that we didn't have sufficient storage space to order the prawn version of this as well. The chicken was nice and tender and the ingredients were well cooked. The soup was the perfect balance of sour & spice... I'm glad to say I didn't cry after finishing a bowl! Green Chicken Curry - (bottom left of introductory picture) Nothing special, just your standard green curry. The green curry at Suanthai is sweeter and thicker than most places; definitely more coconut milk in this version. Boneless Stuffed Chicken Wing - These juicy chicken wings were practically bursting with flavour. The savory seasoning and stuffing could give KFC's 11 secret herbs and spices a run for their money. A Thai delicacy, I'd say this is a must try. Chicken Wrapped in Pandan Leaf - Hmm. I have mixed feelings about this one. The pandan leaves lent a very nice flavor to the chicken. However, the chicken was too dry - It would have been much better if the chicken was steamed rather than fried. Plus, this dish was literally bite size.... think of a KFC popcorn chicken. Or two popcorn chicken(s?) fused together (I don't know what is with these KFC analogies). Thai Style Chicken Satay - Definitely a must try as well. The chicken pieces are larger than the Singaporean style satay. Well seasoned with peanut sauce and sweet chilli, the thai style chicken satay reminds me of a kebab stick sans vegetables. Dessert - We tried all 3 desserts (Thai Red Ruby, Steamed Tapioca & Mixed Fruits). The steamed tapioca was a hit, the Thai Red Ruby a miss and the Mixed Fruits was definitely a welcome refresher after a heavy meal like this one.